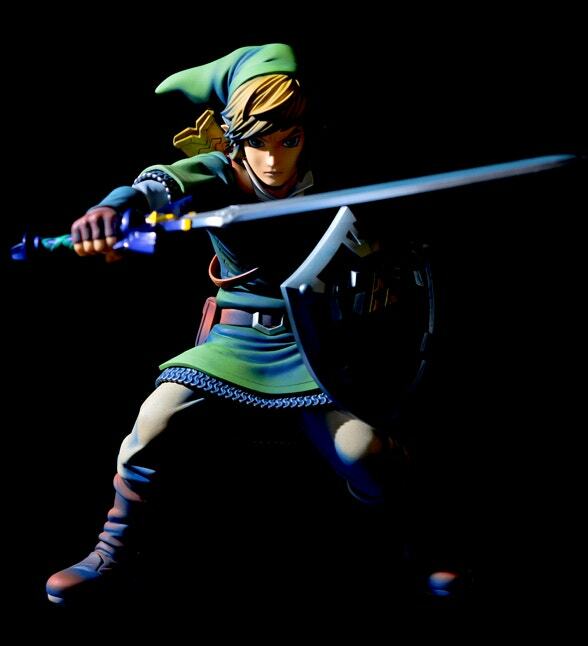 From the popular action adventure game 'The Legend of Zelda: Skyward Sword' comes a 1/7th scale figure of the main character, Link! 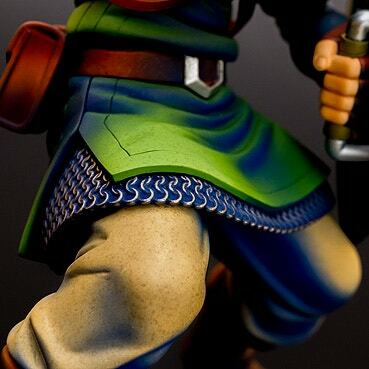 The unique appearance and style of the key visual of the game has been brought to life with intricate sculptwork, and careful paintwork has recreated the shadows and textures of the figure in perfect detail to create a figure brimming with quality for fans to enjoy! Add the hero with the fate of the world on his shoulders to your collection, and enjoy his zealous spirit by your side whenever you like! 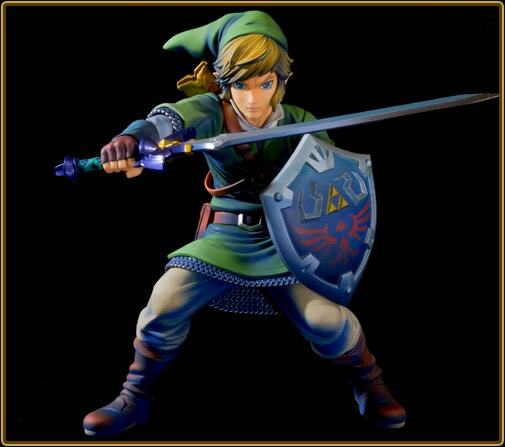 Areas such as Link's hat, shoulders and knees have been colored brightly to represent a stronger light on them. This causes the blue shadows all over the figure to be visually recognised as shadows much more easily - the light brings out the shadows! Brown boots with a blue shadow. Normally shadows are formed by simply painting a darker color over a lighter color, but this figure makes use of a bold combination of colors that focuses on the use of light with a blue shadow, creating a unique look that brings out a fresh atmosphere. The original illustration was drawn as if painted on coarse paper, and the figure has been made to match that look as faithfully as possible with a noise effect in the paintwork. This technique purposefully makes the figure look less clean and perfect, and instead match the atmosphere of the illustration and series. 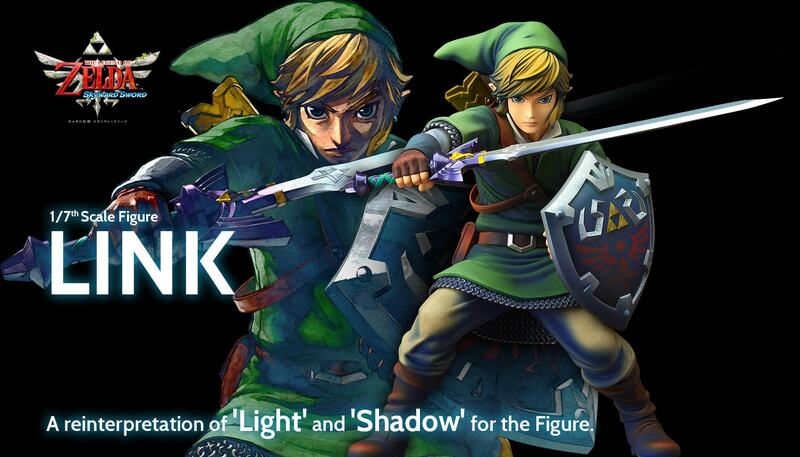 The highlights from above and the blue shadows from beneath create a varied effect in the light over the figure, which couples with the sharp sculptwork of the figure to make Link stand out from the rest. 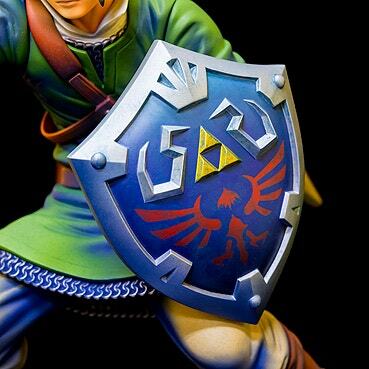 The shield Link holds has clearly been though many a battle, and the darker tones from the original illustration faithfully represented. 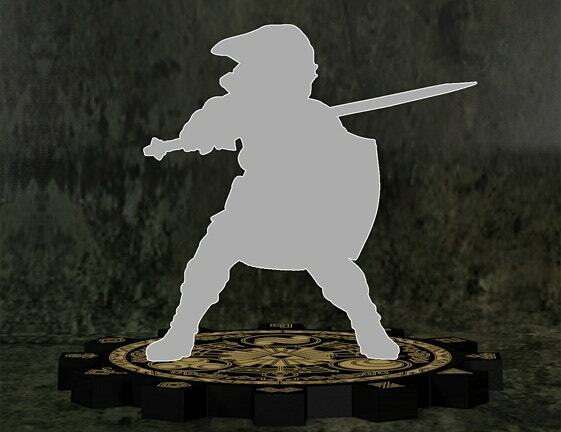 Just one of the many highlights that shows the effects of light and shadow that can be achived on a static statue figure. 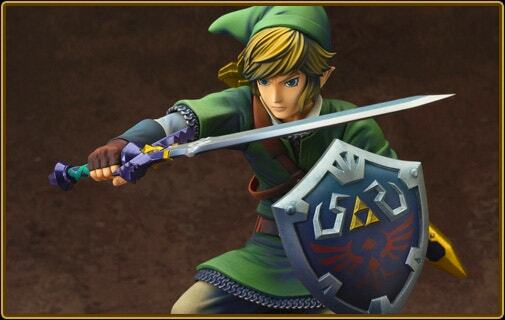 Link's sword has not only been painted with a metallic color, but also features careful highlights to capture the gleam of a sword as best possible. 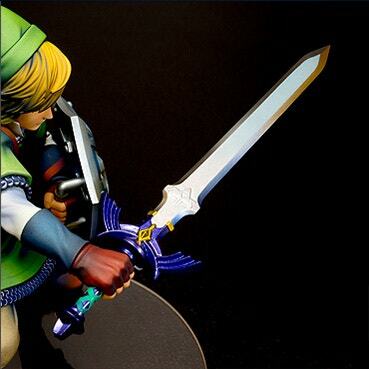 The overall appearance has also been carefully sculpted to look heavy, just as a sword should be. 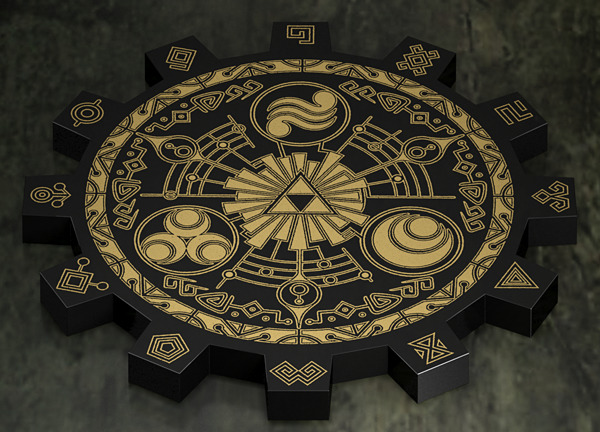 The base Link stands upon is based on the design of the 'Gate of Time' with a matte black and gold color scheme that matches with the atmosphere of the figure and provides an exceptional high-grade appearance. *Image for illustrative purposes only. 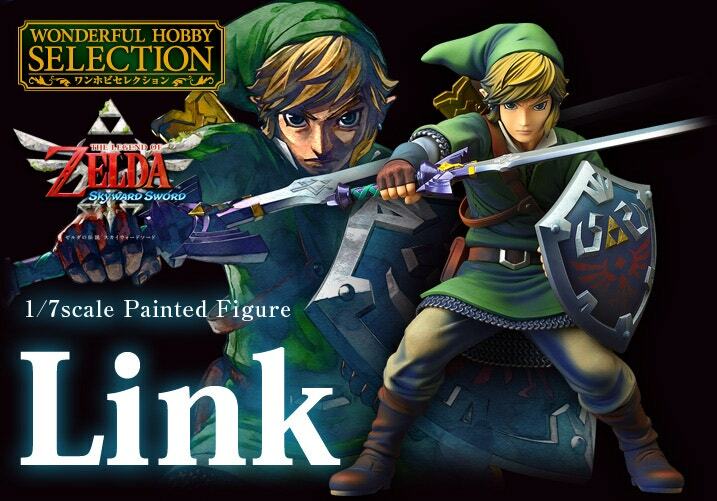 After much deliberation we managed to keep the overall outline of Link from the front in tact, while placing him in a stance that has power put into his shoulders that creates a kind of depth to his pose that gives it a feeling of motion - I think we really succeeded in creating a figure that captures the strength of Link for fans to enjoy adding to their collection. 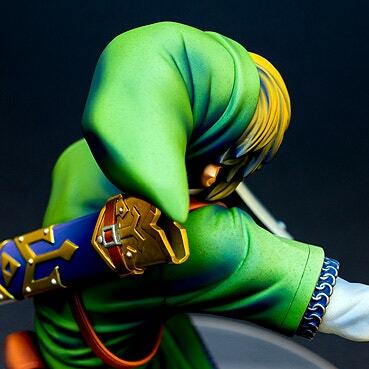 I'm Hiroyuki Hirose from Decomas Lab, and I was in charge of the painting of this Link figure. Recently there have been a lot of figures that we at Decomas Lab have really had to think about how to approach before painting. The figures that need some kind of unique or special paintwork often bring a lot of hard work and consideration with them, but they are always so much fun to work on! I can't wait to work on the next one! The biggest theme for this paintwork on this figure was bringing out the 'blue shadows' that were so prominent in the original illustration. 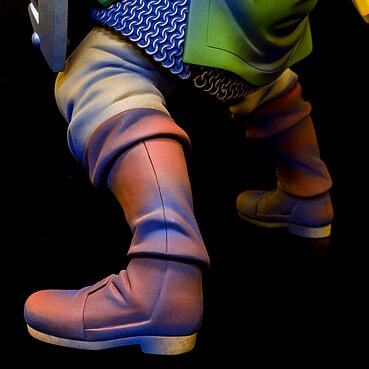 This brought on all sorts of questions such as just how effectively could the use of light in the illustration be applied to a figure, or just how far could I go with the paintwork detail while still keeping the product plausible for use in the final manufacturing process? I went through a number of different renditions and through lots of trail-and-error finally managed to create the figure you see now. There were certain parts on the figure where I made use of a very specific foundation color, or even complete painted out areas for the shadow to stand out more - but I have nothing but praise for the sculpt of the figure. Particularly the sculpt of the hair as well as at the knees allowed the shadows to fall so nicely with the sculpt that it made my painting feel so natural. The figure also featured a coarse effect that you'd probably never see on figures of cute girls - this was also a nice new challenge that somehow gives the figure a kind of optical illusion of being more like a 'picture' than most figures. This is one of those figures that you really need to take a nice close look at with your own eyes! 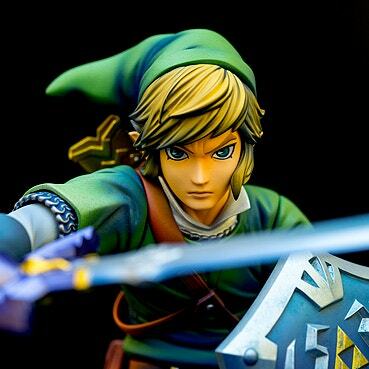 we will be offering free shipping on all orders of our Link figure from the shop. *Photos of the product on this page are a painted prototype. The final product may differ.